A flag stop is made when someone needs to get off or get on a train at a stop it normally would not make. These were usually in isolated areas. Flagging was done by the passenger on a train notifying the conductor in advance about getting off at that location. Or, by someone setting a signal at that stop that would notify the train crew as it arrives. The fare and ticket would be bought on board the train. Elm Park on the main line of the Baltimore & New York was a 1900 era wooden shelter with a cinder and brick platform located at a grade crossing. The main line here passes by a beach. 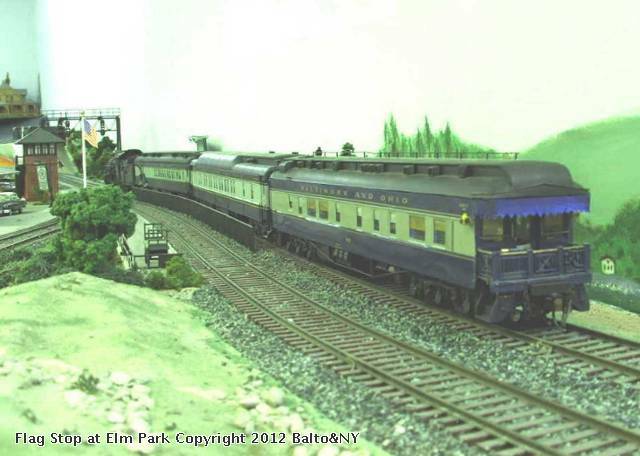 The train is an All Nation 4-4-2 detailed as a B&O A-3 class loco, with an early 1940s Walthers kit-built combine, a Golden Gate Depot 12-1 Pullman, and an office car built from a Walthers executive observation kit in the 1950s. It was rebuilt to more closely model a 900 series B&O wood body/steel framed office car that had been modernized with steel sheathing, AC and updated interior.